We've got 2 layouts for you. Layout 1: We've got the the LFO off the main board to hopefully prevent the dreaded LFO tick. Should fit in a 125b like the original. Downside is that there is more offboard wiring you will need to do. 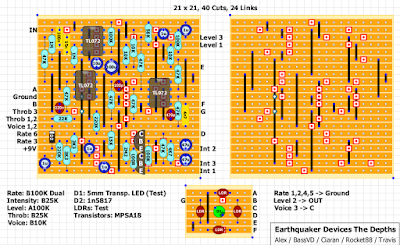 Layout 2: Slightly larger board, with the LFO on the main board. You shouldn't get any ticking, and you'll save on having to deal with the extra offboard wiring. Verified bottom layout! Had to use diffused LEDs as for some reason when i turn up the voice pot to max it blows the clear ones. Used GL5549s for LDR and diffused yellow LED. Need to try some different LED colours and maybe LDRs as its not quite perfect yet but pretty damn close. Scrap that about the clear LEDs. I must of had a couple of dodgy LEDs as tried again with a clear and it worked fine. Schematic is in the Forum section. Does it sound like the video? It's hard to say as these guys can really play and there setup is probably very different to mine but mine definitely isn't as clean sounding but that may be the choice of LDRs or LEDs. Its something i need to experiment with when i have time. Oh, thanks as always for your sterling work and all who contributed, Cheers. Ok, so the noise seemed to be from the LED attached to the pedal (used an Ultrabright) as i hadn't covered the LED/LDRs. Normally that isn't a problem as I like my studio quite dark. Covered the LDRs/LED with a bottle cap and it cleaned it right up. Now sounds like the video, pretty much. not sure how you're searching in the forum will, but it's under the requests section, and it's on the first page of the thread. Thanks for the quick reply, Zach! Honestly, I tried this again. If you enter the title to the layout as posted above the 3 search returns that come back don't include this thread. It's probably because the thread with the schematic has a shortened title (with the initials EQD) instead of using the full title; Earthquaker Devices. I guess I should have figured this out myself. Maybe try a GL5528 or GL5537? 150k-10M for the 5549 is quit a big sweep vs a 15k-1M for the GL5528. Hey Arnold, Thanks for the suggestions. I do have these and will give both a try out. Will let you know the results when i give them a try. How do you guys feel about a 2n5088 as a replacement for the MPSA18? Tayda does have them, but I just did an order a week ago and it'll be a while before I can do another. I've got everything else. nope. mpsa18 have gains in the 10000 range. you should be able to grab a few super cheap on ebay for now if you don't want to wait for an order from tayda, in fact thiashine on ebay is tayda with shipping basically included. it's always good to have mspa18 around, so i would get a few now for this build, then on your next tayda order add a bunch cause they're still super cheap. Socket and try. 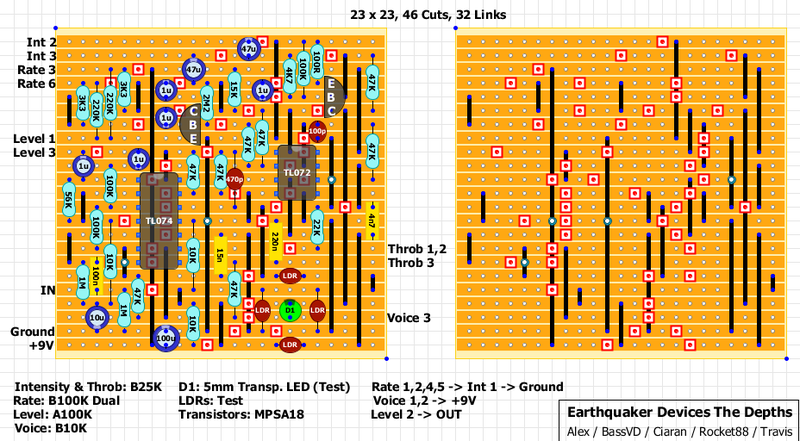 It might work, as the MPSA18s are here the LFO, so the different hFE might not be a problem. But I do agree with Zach: MPSA18s are always handy, so it makes sense to stock a few in your parts box. 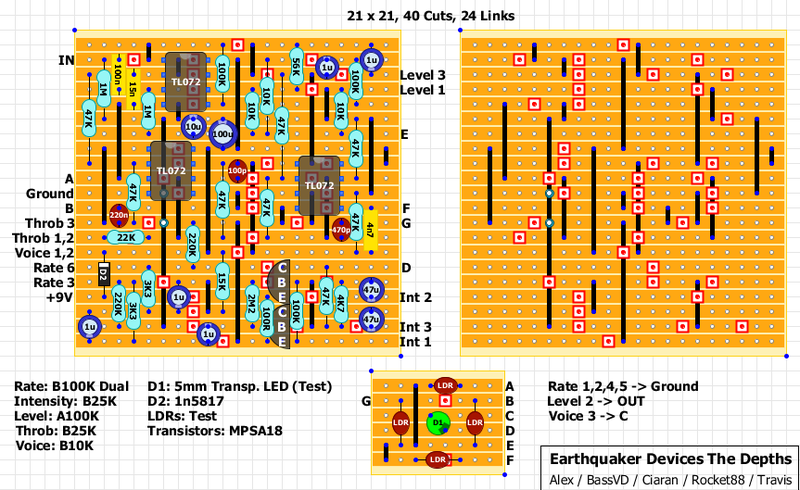 ...and that's Layout 1 with the daughterboard verified too. No ticking and fits in a 1590B! Cool Ciaran! Thanks for the schematic! How do you guys think this compares to the Runoffgroove Tri-vibe? I've built this, the Tri-Vibe and Madbeans Wigl. So far I like this the best but I need some time to compare. The TV is great but I found I only used the Univibe setting so I didn't want a BB size pedal on the board when I could build a dedicated vibe in a B. So I built the Wigl. Another good one but not as shifty as The Depths. Need to put this on the board now and see how I get on. The Tri-vibe has a vibrato mode and a Phaser mode a la Phase 45, which is a subtle, vibe-y phaser (mode 3, "whirl" is a blend of both). The Depths seems more like a straight univibe type circuit which will have more throb and movement than the phase mode of the tri-vibe (swirl). About ldrs i remember pangea project, a wodoo vibe clone, using 3 5549 and one 5516. Wich ones have you used withthat one? Are they working properly? Great schem and layout by the way! Seems like it doesn't go very slow. Kind of medium speed to fast. I'm wondering if there's a cut beneath the LDR on row 'A' of the first layout? I'm not getting any throbbing with my build. Has anyone succesfully built the 125B version? I built it up, but am getting no signal passing. Audio probing it, I get signal to the TL074 (pin 5), but nothing after that. The rate, intensity and voice pots all seem to work, so its just a question of why my signal is not getting through the first IC. i believe ciaran verified that one. post up pictures, description of the problem, and your voltages in the debugging section of the forum. I'm having the same issue. When turning the effect on all the sound goes away. Sry , left out: I also tried the first version with two tagboards. Built Layout 2 (onboard LFO) and verified that it's working great with no LFO ticking! Used 4x GL5539 LDRs and a 5mm water clear green LED. I also wired the LED indicator's + to the LFO's +, so the LED indicator now pulses with the LFO! Hi Yonathan, how did you manage to let the indicator led pulsate with the rate? I tried connecting it to voice 3, but this resulted in an out of phase led pulsation and a big influence on the Overal effects sound creating some sort of double echo effect. Does your solution leave the sound unharmed? Hi Jonathon Yi, how did you wire the led indicator that oscillates along with the LFO? Anyone tried the vero on 18V? yeah I have! To me the difference is minimal, not enough to make me want to go the extra expense to use a 18v supply. I think it's great on 9v as is. Also I have tapped the minus on the LFO to a LED with the plus going to the 9volt supply. This way there was no change to the tone or settings. However, when you turn the voice down the indicator gets brighter instead of replicating the LFO when it get less bright!! Still no difference to the tonal output. Hope that helps? Hi Bill thanks for the reply. Im kinda new to univibes so if you say the minus of the LFO Do you mean the minus of one of the four LDR's? Sorry for late reply....no the minus side of the LFO LED, I used a 9v supply for the indicator LED with a CLR 3k3 and connected the minus side to the minus side of the pulsing led. But the brightness will work in reverse to the voice control, so maybe not a great idea!! I also used a 4558D chip instead of the TL072 and it works really well.....I think maybe my TL072's maybe fake!!!! Figured it out almost immediately after I posted. lol. Ok. I thought I had this all figured out, but I did not. I'm getting signal when the effect is on, but there is no effect. no swoosh, though I can hear the lfo clock with everything dimed. As such the LED is pulsating and reacting to Voice, Rate, and Intensity, so I'm pretty confident the LFO is functioning. I'm using four LDR's from tadya, which the datasheet I can find says should have 10k - 500k range, though when I measure with my multi they are more like 20-30k to 1m or more. Not quite sure I'm getting accurate readings tho. Should I just get some GL5539's? I feel like I should be getting some kind of effect in this range, even if its not accurate to the original. As I said, the LFO seems to be working correctly, but here are the voltages regardless. any help is appreciated, I'd really rather not have to rebuild this bad boy. P14 on the TL074 seems very high. Check for a short there. Found it! up and running now, and boy does it sound cool. Thanks Mr. Grim, I really appreciate the help. is there a vibrato or tremolo mod that i could do? When running the effect on 18V and with high intensity, I get a clear LFO tick. When I switch back to 9V it disappears. Also when I roll back intensity and/or voice when using 18v makes it also almost disappear (but not 100%). Any thoughts? The original is also able to run on 18V, hence the question. PS I use a switchable chargepump (9v/18v) with a LT1054. Start by triple checking for shorts and reflowing your soldering. By C you mean the collector of the MPSA18? Did you also check that you got the orientation of the LED correct? I have never used LDR's before. I assume there is no + or - ? Was planning on using a 5mm clear LED. Also wondering if the LDR "grills" needs to be oriented facing the LED or if facing up will suffice? Any need for a reflective surface inside the box? I have tested this one with all kinds of LED (transparant, diffuse, red, green, yellow and blue) and personally find the combo of diffuse yellow with 4x GL-5549 the best. For this build you can best position the LDR facing the LED and put it close to the LED. There is no need for a reflecting cap. The original also does not have a reflecting cap. any video of a working build ? Does anyone else think the throb control is a bit weak??? I am really struggling to hear what it does, and i can't see any changes with the led. For a while i was thinking it was my build and that maybe it was a faulty pot or something but after watching some demos for reference I still can't hear it doing anything. Any of you guys had this issue. I haven't bothered matching my ldrs as it sounds pretty damn good and true to the demos, beats my madbean univibe build. I can't say I hear a difference yet. I never match my ldr's on these circuits and they don't sound anything less than anyone else's I've heard but that's just me. Any help would be greatly appreciated! I'm considering just replacing the bottom two ICs and the MPSA18s, but was hoping y'all might have a more precise fix. Thanks! Completed the layout with o/board LFO, works like a charm, almost. I used GL5549 LDRs and a white diffused LED. However, I strongly suggest adding an offset control as per JC Maillet's instructions for his univibe build, also found in the Harbinger One build. I had a problem with LED stop oscillating when intensity, voice and rate were down low, and then would only start up slowly after cranking the said controls all the way back up, if I didn't it would sit frozen. Also the LED was still fairly bright in it's 'off' position so the depth of the vibe was a bit shallow. I built a few Harbinger One pedals (vero and pcb) last year and remembered the offset control, and it's a similar circuit so I just spliced it in. That solved both problems, LFO doesn't freeze and works smoothly, the depth of vibe can be adjusted now to your taste. I believe the gain trimmer in the univibe clones works similar to the Voice control on the Depths. Works mint! I used GL5549s in a univibe build and they worked really well so i used them in this. Also I would use either yellow or white diffused leds, more predictable performance, the only thing that I believe that matters is how bright and how dark they become and being able to control those 2 things which you can with Voice and offset control. Offset trimmer works best for me at about 1 o'clock. The other being the properties of the LDR's. I was going to try GL55339s and GL5528s but it works so well I can't be bothered, I'll just build another one. I boxed this in a 125B. I am not an expert in this field but I like to have a go and fix things if I can, so thanks Zach for this layout and all the other experts upon whose shoulders I am always standing. I have attached some pics of the build and layout for adding the offset mod. Refer to Madbean Harbinger One layout and JC Maillet's Univibe instructions for offset control information and schematic. I know this is an old thread, but I want to thank you for posting the trimmer info. I was stumped on trying to get the LED to go dark in between pulses - the vibe was subtle it was unusable. The little 3x7 daughter-board fit perfectly on the side of the 125B. The pedal now sounds amazing!! Im having trouble getting my rate pot to work on this effect. I have it on a breadboard, not insidecan enclosure. My LED does not pulsate. I have signal, and i can hear that the output level, throbe and tone work (LED gets brighter and dimmer with tone control), but get no intensity or rate control. Ive gone over the layout and checked for solder bridges a dozen times. I only know how to use an audio probe when checking for signal with a dead circuit. 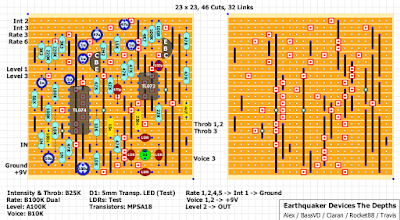 Since i have output, and my soldering and layout work looks good, im not sure what to do. Any tips would be greatly appreciated. Did you check your transistors? Looks like they're not ok. Check their orientation and/or replace them. Should be LDR's not LED's and they need to be covered (I used a bottle cap on my test circuit) until you box it. The circuit works so I would go over the layout again and check EVERYTHING, every component, cut, link,component value etc. 99 percent of the time it will be a small mistake you have overlooked. If you are unlucky a faulty component but I'd check that layout again first as you may have tunnel vision and keep looking past the problem. Like Arnold said, check transistors and IC's and go from there. Check your electro values. If the 47uF are smaller it would look like the LFO isn't working, when in fact it is...just really, really fast. That's what tripped me up when I did the trace. @patrick shroering - did you sort your problem? I'm having the same issue and wondered if you had a solution. @oldmanonthehill... had the same problem too. It was a bad MPSA18 transistor at Q2. Is it possible to use only one LDR, with 3 strap between each lugs of one LDR ?? Salve a tutti..ho costruito questo progetto e funziona tutto tranne il throb...non ha alcun effetto sul suono...qualche suggerimento? Built it, worked on first try but I now remember why I sold my original The Depths some time ago. I think I'm more of a vibrato guy. But there's nothing wrong with this and if you're into vibes -> go with it. I used 45k-140k,10M LDR's and a diffuse yellow LED. I built the second one, with the TL074. Works great, but i dont hear the throbe working?...ive built the first layout using 3 TL072’s, and the throb worked great. With the TL074 layout, i seem to hear the theob work, very sibtly, only ehen the intensity is all the way up. Any ideas on where my mistake could be? I had the original some time ago and remember that the throb was also very very subtle. I also built the second layout. Maybe I should try the first one or somebody has an idea for a tl074 replacement? Can anyone please tell me how the lugs of the dual pot are numbered and should the led be on when the effect is off? Thanks. Led does not pulsate. Intensity of the led only changes when I rotate the voice pot. Any help would be appreciated. Intensity pot should do that. Brighter for a brighter sound, dimmer for darker. Id check everything around the rate pot or in its path. Check your values and make sure theyre all correct. Thanks Gumbi I am not sure of the numbering of the dual gang pot. I have it as top row from left to right lugs 1 2 3 and bottom left to right 4 5 6. Is that correct? I just checked it again and the intensity pot does nothing and when I turn the voice pot cw the led gets brighter and dimmer if turned ccw. Never does the led pulsate.